Creativeworks London funded London-based creative entrepreneurs to take up a short-term residency with one of its research partners. The examples below demonstrate the range of residencies that were funded by CWL. More information about the scheme can be found here. 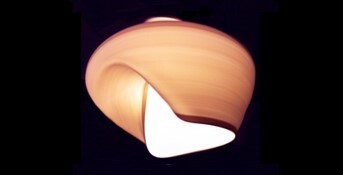 Patrick Laing is an product designer and inventor of the Flying Skirt light-shade. Laing’s lights-shade appears like an enormous inverted clay pot on a wheel, when the light is turned on the fabric spins into motion generating a fluctuating form. For his residency with Camberwell College of Arts set out to continue the development of this product, infusing its already hypnotic qualities with motion sensor technology so that the shade responses to people moving within its vicinity. Laing’s work with Camberwell College of Arts followed on after a short Arts Council Craft + Technology residency from the beginning of 2013 where much of this work was prototyped. The entrepreneur in residence with Camberwell allowed time to finesse the Flying Skirt into a full production piece. Access to the College’s 3D making facilities were fundamental in this, and Laing has also benefited from having marketing material created whilst at Camberwell. In September Laing presented the shade at the Tent & Super Brands London trade show. In addition to a production version of the Flyer Skirt Laing’s residency also allowed for the development of a more commercially attuned version, Dancing with Knees, which differs to the Flyer Skirt in its cone, rather than pot, like shape. During the residency Laing presented a lecture to Camberwell BAs, additionally his exposure to MA students has proved the possibilities of establishing and running their own business. Camberwell plans for more follow up lectures with Laing in the future.